Braddell Heights Estate is a hilly area bounded by the main highway, Braddell Road in the south, Lorong Chuan in the west, Upper Serangoon Road in the east and Serangoon Avenue 3 in the north. The estate which has a small park (Serangoon Park) is referred to as Serangoon Park in some publications. 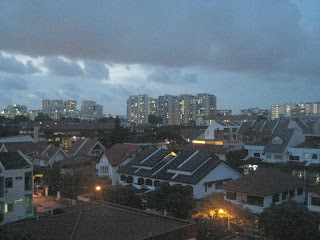 Older Chinese refer to the area as Hougang four and half milestone. At the junction of Braddell Road with Upper Serangoon Road and Bartley Road is Singapore's first four-tier interchange, with, from highest to lowest, Upper Serangoon Viaduct, Upper Serangoon Road, Bartley Underpass to Braddell Road and NEL MRT tunnel. In colonial Singapore, official street names were assigned at municipal meetings on the approval of Municipal Commissioners. Names were normally proposed by municipal assessors although suggestions sometimes originated with the commissioners or requests of property owners. The estate has a good mix of interesting British road names (towards the south and west of the estate) and Malay road names (towards the Serangoon side on the north and east). Many of the British road names were named after scenic places in Britain, perhaps reflecting a sense of nostalgia for the beauty of their home country which colonial masters wanted to project to Braddell Heights. The hilliness and slopes of Braddell Heights were also portrayed in the place names chosen (e.g. Clifton, Matlock, Chiltern & Muswell are hilly areas or villages) and in the hill and valley descriptions e.g. Vale, Rise and Hill. Many of the Malay names reflected a theme of happiness and enjoyment which the locals wanted for this pleasant area. Constructed in the pre-war era, Braddell Road was named after the Braddell family which included several eminent members. Thomas Braddell (1823-1891) began his career as a sugar planter and then joined the East Indies Company in 1849. He was called to the Bar in 1859 and was Crown Counsel and Attorney General of the Straits Settlements (1867-1882). His son, Sir Thomas de Multon Lee Braddell was Chief Judicial Commissioner, Federated Malay States (1913-1917) and Colonial Secretary. The grandson of the first Braddell, Dato Roland St John Braddell was born in Singapore 1880 and was Municipal Commissioner (1914-1929) and author of several legal and historical books, including the Law of the Straits Settlements, Legal Status of the Malay States and One Hundred Years of Singapore. He was advisor to UMNO and was involved in the negotiations which led to the formation of the Federation of Malaya in 1948. Croucher Road: named after Dr Croucher, Principal Civil Medical Officer and Municipal Commissioner during Arthur Young’s governorship (1911-1919). Sommerville Road/Walk: named after MR Sommerville and his brother. One was the Director of Straits Steamship Company and the other the director of Blue Funnel Line (Ocean Steam Ship Company). MacKerrow Road: named after William McKerrow, assistant to John Little & Co and associated with Patterson Simons & Co. He resigned from the Municipal Commission over the erection of a fire station in what is now Raffles Place. Wolskel Road: named in 1934 after Wolskel, managing director of a local company. Vaughan Road: named in 1934 after Jonas Daniel Vaughan, Assistant Magistrate and Resident Councillor in Singapore, 1861-69. He was a leading member of the Bar until his death in 1890 which occurred when he disappeared from a ship returning from Perak.. He had defended ex-sultan Abdullah for the murder of Mr JWW Birch, the first British Resident of Perak. He was the author of the book, Manners and Customs of the Chinese in the Straits Settlements. Daisy Road/Avenue: named after the daisy flower. Muswell Hill: named in 1950 after the area of north central London. The name Muswell is believed to come from a natural spring or well (the "Mossy Well"), said to have miraculous properties. The traditional story tells that a Scottish king was cured of disease after drinking the water of the spring/well. The area became a place of pilgrimage for healing during medieval times. It was not until the 19th century that Muswell Hill began to be developed more densely from a collection of country houses to the contemporary London suburb. Dunsfold Drive: named after a village in Surrey in the south of England. The village has many ancient houses of architectural interest. Lynwood Grove: named in 1950 and is a pleasant sounding name in keeping with the other street names in this area off Braddell road. Lynnwood or Lynwood, a common place name in USA and UK now, was also a place name in beautiful Cumbria, The Lake District, England. Cotswold Close: this unique rectangular ring road with two exits was named in 1950 after a English popular holiday area noted for the honey coloured stone walls of its buildings. The Cotswolds is a range of hills in west-central England, sometimes called the "Heart of England", an area 25 miles (40 km) across and 90 miles (145 km) long. The area has been designated as the Cotswold Area of Outstanding Natural Beauty. The area is characterised by attractive small towns and villages built of the underlying Cotswold stone (a yellow oolitic limestone). Clifton Vale: named in 1951 after a town on a steep hill in south west England. Chiltern Drive: named after a range of hills to the north west of London. The Chilterns are an unspoilt area of rolling chalk hills, magnificent beechwoods, quiet valleys and charming brick and flint villages with a wonderful mosaic of woods, fields, hedges, sunken lanes and clear streams. Melrose Drive: named in 1951 after a town and ancient abbey (among the most beautiful of religious houses in the UK) the Scottish Borders. Matlock Rise: named in 1951 after an English town, a spa resort in the hilly area of Derbyshire, UK. Sundridge Park Road: named in 1951 after a village in Kent, one of the most beautiful counties in south of England. .
Jalan Girang: meaning happy, glad, joyful, delighted, elated and merry. Jalan Riang: meaning happy, joyful and elated in high spirits. Jalan Ria: meaning lively, enjoyment and pleasure. Bukit Arang Road: meaning charcoal hill. Charcoal was the cooking and heating fuel in the days before electricity. Note Bukit Arang Road is next the Wolskel Road where the tycoon Lim Loh’s family biscuit and brick factories were located. Lorong Selangat: named after a common marine fish (Chacunda gizzard shad) which is silvery on sides with a large black spot behind gill opening. The fish is highly resilient. Can grow to 22cm and is important for commercial fisheries in South east Asia, Indian and Pacific Oceans. It is marketed fresh, frozen, dried, dried-salted, boiled or made into fish balls. Lorong Chuan ( 罗 弄 泉 ): meaning fountain in Chinese/Hokkien. This is an auspicious name referring to wealth and prosperity. 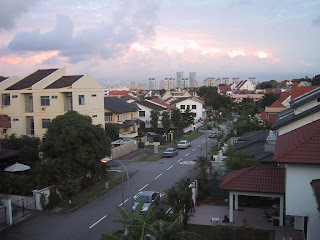 Serangoon Avenue 3 / Serangoon Road: the origin of the name is uncertain. The name was likely to be derived from a small marsh bird, the burong ranggong, which was common in the swamps of the Serangoon River (formerly the Rangon River). For the Chinese, the road is called hougang lu or ow kang meaning back of the Port road, signifying the back of the Port in Kallang. One of Singapore's most successful towkays wealthy industrialist Lim Chee Gee, better known as Lim Loh, made his fortune in pre-war Singapore in rubber estates, brick and biscuit factories as well as trading and construction businesses. Lim Loh was born in Fujian Province, China in 1851 and came to Singapore. He owned a rubber plantation estate bounded by Braddell, Wolskel and Upper Serangoon roads, where he built three bungalows for his family to live in. He also had two brick factories and a biscuit factory in Wolskel Road. The tycoon had six wives, 19 sons and 9 daughters. Lim Loh built several of Singapore’s building landmarks. These include Victoria Memorial Hall, the old Parliament House and part of the Goodwood Park Hotel. Lim Loh died in 1929 in Singapore. War hero Lim Bo Seng was his son. Lim Bo Seng (simplified Chinese: 林谋 盛; April 27, 1909 - June 29, 1944) was a World War II anti-Japanese Resistance fighter who was based in Singapore and Malaya. As he was very active in many anti-Japanese campaigns, his name appeared on the Japanese's enemies list. He recruited and trained hundreds of secret agents and he set up the Sino-British guerrilla espionage group Force 136 in mid-1942. He was eventually captured, jailed and tortured by the Japanese. Lim Bo Seng is truly a war hero as he fought and sacrificed his life for his country. His steadfast refusal, despite painful torture, to reveal information which would endanger his comrades and the cause he was fighting for, made him even more admirable. According to Mr Lim Teck Kiam (a descendant of Towkay Lim Loh) of Sommerville Road, Lim Loh was a very rich man and owned over 100 hectares of land estate at Braddell Heights (known to Chinese community as Hougang 4 and half milestone area). His land area stretched from Serangoon Road to Lorong Chuan and Braddell Road. The other land owner within this area was an Arab and owned a smaller portion. The whole area was previously mainly a rubber plantation. During the war years, the plantation was cut down by a contingent of Indian soldiers, as burning fuel for cooking food. Lim Bo Seng’s two factories manufacturing biscuit and manufacturing red bricks were located in Braddell Heights estate next to Lim Teck Kiam’s father’s cupboard and cabinet making factory. The estate is home to more than 1000 households as well as several places of worships (including Bethel Presbyterian Church, Neighbourhood Christian Church and Meow Im Kok Yuen Temple) and two nursing homes (namely Nightingale Nursing Home and the newer Econ Nursing Home). Older condominiums/apartments include Braddell Park, Serene View Mansion, Daisy Park, Daisy Lodge, Daisy Apartments, Clydeswood and Meihe Gardens. Newer condominiums include Springbloom, The Arcacias, Sommerville Regency, Melrose and Sunnydale. It is served by the Serangoon MRT station and in future the Lorong Chuan and nearby Woodleigh MRT stations. In summary, the names of the roads in Braddell Heights Estate are meaningful and contribute to the pleasant environment of the hilly estate. The British road names portray the most beautiful of the scenic areas in Britain for Braddell Heights while the Malay road names instill happiness for its residents. It is hope that with inspiring examples of industrialist Mr Lim Loh and war hero Mr Lim Bo Seng, former residents of the Braddell Heights area, residents can follow their examples and contribute meaningfully to the community. 1. Raja-Singam, SD. (1939) Malayan Street Names: What They Mean and Whom They Commemorate, Ipoh: Mercantile Press. 2. S Peter KG Dunlop. (2000) Street Names of Singapore. Edited by Low Kar Tiang and Janice Liu Yan Rong. Singapore; Who’s Who Publishing. 3. Victor R Savage and Brenda SA Yeoh (2003)Toponymics. A Study of Singapore Street Names.. Singapore: Times Media Private Limited. 4. Arts Donation turns into family reunion. Tara Tan, Arts Reporter. Straits Times 14 August 2008. 5. Brief Biography of Towkay Lim Loh. Straits Times 14 August 2008. 6. Transcript of Amy Tan’s interview with resident neighbour, Mr Lim Teck Kiam of Sommerville Road, Braddell Heights (relative of Mr Lim Bo Seng and descendant of Towkay Lim Loh). 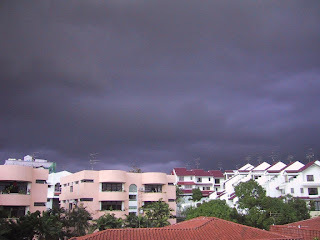 26 August 2007. Interview was part of the Amy Tan’s Raffles Girls Primary School Primary 4 social study project on war hero Lim Bo Seng. 7. MY HERO – LIM BO SENG. Amy Tan. Raffles Girls Primary School Primary 4 social study project on war hero Lim Bo Seng. 30 August 2007. 8. Wikipedia and Google searches on Muswell Hill, Dunsfold, Lynwood, Lynnwood, Cotswold, Clifton, Chiltern, Melrose, Matlock and Sundridge. Noted people are interested in Braddell Heights, one of Singapore older private estate with a rich history. Interesting to note that Sommerville Regency (at Lorong Selangat, off Sommerville Road) is named after as Sommerville Regency and not Selangat Regency. I suppose it sounds smoother and a English origin name may rhyme better than a Malay origin name for Regency. A lot of European names are used nowadays. In fact along Sommerville Road there are the Arcacia and the D'Almira - both European names. Braddell Heights Estate with a predominance of Chinese residents has both English (British) and Malay street names and flavour. So it fits new housing projects to adopt either European or Malay sounding names. However it seems that European names rather than Chinese or Malay are more in vogue. The expatriate Ang Mohs are also increasingly seen in and around the Estate. 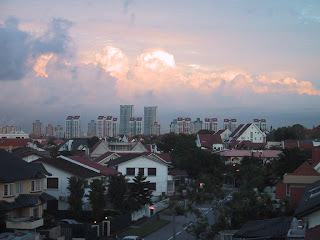 Braddell Heights Estate is a hilly area in Singapore, bounded by the main highway, Braddell Road in the south, Lorong Chuan in the west, Upper Serangoon Road in the east and Serangoon Avenue 3 in the north.